Check this out....a near “Compact” Phantom? 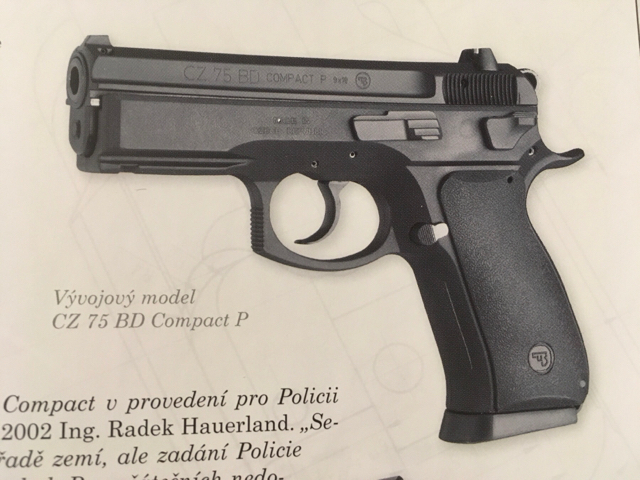 Developmental model CZ 75 BD Compact P with polymer frame that was completed in 2006. It didn’t go into production due to the decision to go ahead with the Duty (P-07) model. From the Pazdera book, Legenda jménem CZ. The P-07 hammered the first nail in the coffin of any SP-01 Phantom C, and the P-10C sunk in the final nail, which is unfortunate, as the Phantom is an excellent heavy duty pistol. I think a compact version might have been a winner. I think the only chance we have of that happening is the Czch Army suddenly deciding it needs a compact model of the Phantom to complement the full size they issue now. Very NICE - I saw some Phantoms at the show recently and they are very nice. A compact would have been great. Of course Tanfoglio DID go this direction. (At the price point they need better sights). That is cool. So wish they would do it. Seem like such better piece would sell better as it is that sweet “G19” size for CCW. So far the only CZ I have ever owned is the P-10. Going to have to broaden my horizon and acquire some of the other models. Have a 2017 cajunized Phantom. I just got a P10c. Out of the box the P10c has a better first trigger pull but out of the box and ESPECIALLY the single acting n follow ups on the Phantom are better. Now my defensive carry package on the Phantom- the da trigger pull is about as good as the P10c and the single action pulls are twice as light and the reset is half as short as the P10c. Bottom line I wish they’d make that phantom instead of the fat boy p07. Guaranteed it’d sell more than the p07, too. The phantom would have sold more guns if they had never introduced the cz p09- an inferior pistol. Ugh.